I was on the radio Monday and Tuesday and there was nothing on this side of the pond either Julian. As a side note I was looking into getting the Wonder Wand. It is compact and if there is nothing around to string up this antenna is great. I do have the Miracle whip but it has lots of battle scar's and I hear the Wonder Wand is better than the Miracle whip as well. I'm glad to hear you feel a bit better. Look up aluminum rollator. This is a wheeled walker, on three nice large wheels, folds flat, so is easy to load on a bus and it could give you stability and a way to transport more/better/bulkier gear for your ham excursions. 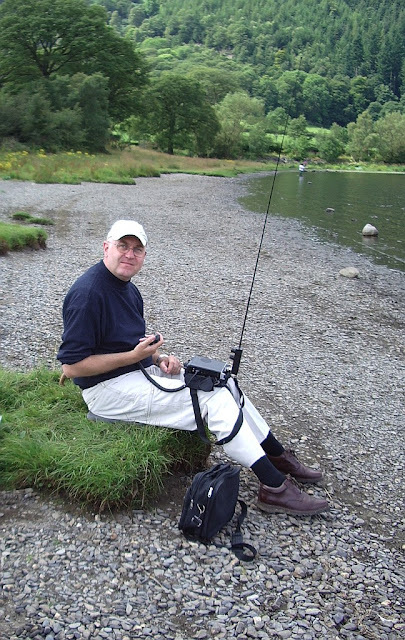 Surprised you didn't have the spinning rod out Julian....some good pike & perch in Bassenthwaite lake, me and my Missus were at the pheasant for a couple of nights last week! Good to see you out in good weather: here it has been pouring down with rain all day. Interested to hear you visited St Helena and Ascension Is. I had a love affair with Tristan da Cuhna at one time! Glad to hear you are getting out and about end enjoying yourself. As to "DX". This summers Es openings on 6 meter where rather interesting. As you know contacts are usually short and sweet - signal report and grid square and on CW all of about 10 seconds in total. I had the unfortunate displeasure of meeting a couple of Hams on the air that where calling CQ DX. Well they where in the US and I am in Canada and that is DX is it not? Anyways, they simply refused to give a report and grid square but did in fact take much than the simple report would have taken to repeat over and over again "DX, DX only DX DX only DX DX only". Takes all kinds and when I hear stations calling DX only I will still answer when they are obviously not getting other replies just for a quick report and wish them good luck.